As any good pilot knows, having the best wingman makes all the difference in the world. 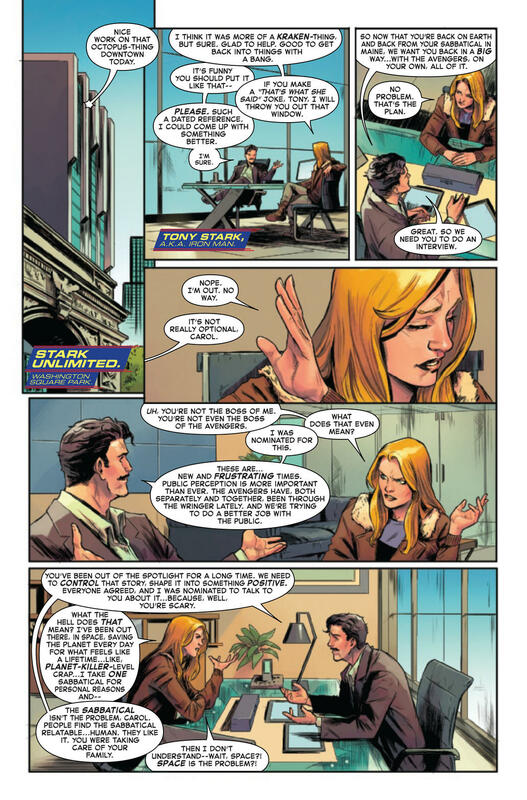 As writer Kelly Thompson kicks off the all-new CAPTAIN MARVEL #1 – available now – she values artist Carmen Carnero’s devotion to duty and craft. "Working with Carmen has been a delight,” she says. “She's not only a fantastic artist but an incredibly generous collaborator. She has a wonderful eye for storytelling and design that constantly impresses me. And the only thing that surpasses her passion for our book is her commitment to doing the best work she can—she has such pride in her work—in the best possible way." We checked in with Carnero to get her own take on this auspicious new flight. Marvel.com: Carmen, this is going to be a huge year for Carol Danvers - how does it feel to be the artist for her book this year? How does that impact your work? 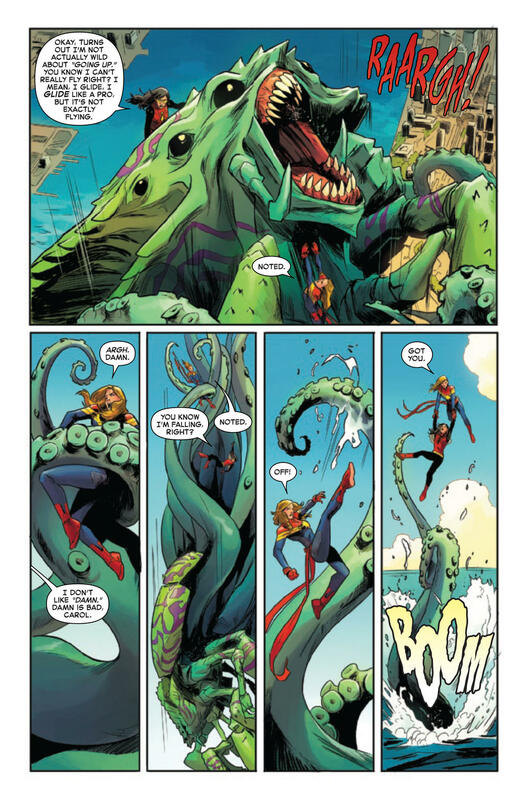 Carmen Carnero: It’s terrifying, hahahaha, but I really appreciate the confidence Marvel has shown in my work and I believe you’ll be able to see that on the pages. Normally, it doesn’t affect my work, but this time we have the movie’s pressure and that implies new readers or curious people that will be arriving from the Marvel Cinematic Universe to look at the comic books. Marvel.com: You've done some really great and diverse Marvel work before this - what of that work do you feel will most help you going forward on CAPTAIN MARVEL? Marvel.com: What's that one thing about Carol that you feel is so important to portray in your art? What do you have to do to really express her character? Carmen Carnero: I think it’s her personality. She’s really direct, her body language is really clear, and her facial expressions and the way she fights. I always try to show that Carol never messes around—she always goes right to the point. When she wants to end a fight, she goes for the strongest hit she can give, and when she doesn’t like what somebody else is saying her face says “I’m going to tell you exactly what I don’t like.” So, yes, basically, I want to show that she’s really blunt and direct. Marvel.com: Carol’s coming home to New York City in this new series—what kind of research do you typically do when a script calls for a very specific locale like that? Carmen Carnero: This time I’ve been really lucky. I received the script before New York Comic Con 2018 and in it, Kelly specified the action would take place on some, well, specific streets. So I had it easy. I just went there to take pictures for references. The Spider-Man PS4 video game has also helped. Blessed photo mode! Marvel.com: Do you have a rule when it comes to getting your work done in a typical day of drawing for you? And will you be doing anything different from that on CAPTAIN MARVEL? Carmen Carnero: It’s very simple: Not getting up off the drawing board until the page is done. There are no more rules than that. It’s also true that, since this is the first series I’m starting with issue #1, this has become very personal. I want all pages to be perfect. Marvel.com: Overall, what’s it been like so far working with Kelly? What does she do in her scripts that really excite you as an artist? Marvel.com: If you look back over all the artists of the past forty years or so who have drawn Carol Danvers, which of them may have inspired you the most artistically? Carmen Carnero: Honestly? All of them, and to be even more honest, I love that the first page is an homage to all of Carol’s former versions. Marvel.com: Well, okay, let’s go there, too—which of all of Carol’s different looks and personas over the years are your favorites? Carmen Carnero: It’s difficult to pick, but it’s obvious to me that the design that works best nowadays is Jamie McKelvie’s. It’s simple but at the same time very effective, and playing with her belt scarf is a lot of fun for me! CAPTAIN MARVEL #1, written by Kelly Thompson with art by Carmen Carnero, is available now online and at your local comic shop!